What a fantastic end to the month, much overdue sunshine! It makes Spring feel like it has arrived and the farm is starting to wake up from it’s winter slumbers. We have been busy preparing for Spring and have been planting new beech hedging which the birds will love once it has established. The Cat Hotel has had another busy month and the diary is full for a number of dates throughout the year already. We have had a few new faces stay recently and have the most unusually marked girl staying called Sunshine. She is ginger and white with large pure tabby sections and we have never seen another cat like her. 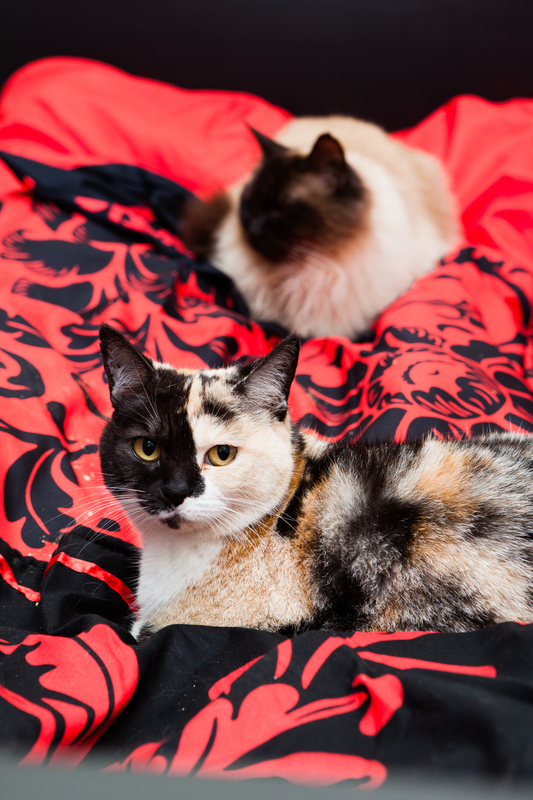 It is a first stay for both her and her brother and they have settled straight away which is just so lovely. We said goodbye to Lucifer, Salem and Yogi yesterday which was very sad. They had been staying here since November and we adored them as they were all such characters, it’s always sad when favourites leave and is the only downside of the ‘job’. The donkeys are loving the milder weather and are outside much more, running around and looking for mischief. I take Percy for walks around the lanes as he loves all the attention, last weekend he did a four mile walk which involved stopping at the shop to buy him an apple and he was full of himself all the way. When we meet a horse rider he gets so excited and wants to join them, but the horses are not impressed!! 2019 is here and fortunately January seems to be going quite quickly instead of dragging it’s heels! It is a cold but clear day here and we are hoping that there will be no snow for us this year. We had such an incredibly busy and fun year in 2018, although the building works in the house were very trying, thank goodness they are now finished, never again! 2019 Looks like it is going to be our busiest year yet. We have shown so many new people around the Hotel since the start of the month and everyone is booking dates and they are very enthusiastic which is lovely. Fortunately most of our regular favourites have already secured their places and the diary is full in quite a few places. My big news this month is that I have chosen the charity which I am going to raise money for by running the London Marathon in April. The charity is the Celia Hammond Animal Trust. 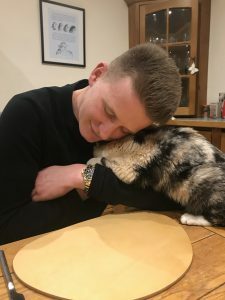 I researched a number of charities as I wanted the majority of the money raised to go directly towards the animals and fell for this charity straight away. Please have a look at their website as they are passionate animal lovers who work tirelessly to help and support in everyway they can. I have set up a Just Giving page which is https://www.justgiving.com/fundraising/jackieferrier if you have a minute have a read of my story and I will update the page regularly. The donkeys are all really well and spend the majority of the time in their barn next to the Cat Hotel eating and sleeping! The cats are fascinated by the donkeys and spend hours on their outside cat trees watching them. They are very fat, woolly coated and extremely cuddly and are so lovely to be with, both donkeys and cats are such peaceful animals and the calm effect they give is wonderful, I really don’t know how people cope with working in cities! We have had a busy January filled with lovely guests who are all warm and snug in their spacious bedrooms. It is always lovely and toasty in the Hotel as the heating is left on 24 hrs a day and it is the perfect place to escape with my book leaving Tim in the house to answer the phone. My Marathon training is going well and so far to plan. I am actually enjoying the training far more than I thought I would. I have a great friend coaching me and we are increasing mileage weekly. This week we have a 14 mile run on Sunday, last weeks was 12 miles which we did in 1hr 55 minutes. For those who also run we averaged 9.38 pace which I am thrilled with. At the moment I am hoping to complete the Marathon in under 4hrs 30mins, but obviously this is dependant on how training goes and what the weather is like on the day. Comments Off on It’s Christmas!!! We are all so excited that it’s Christmas again. All the presents are wrapped and all the cats are having so much fun with the tree, some like climbing it, some like laying under it and some like knocking the baubles off and chasing them around the hall – it is definitely the best cat tree there is! We have had a fabulous year with lots of regular guests and plenty of new faces too. We just love what we do and wouldn’t swap places with anyone. 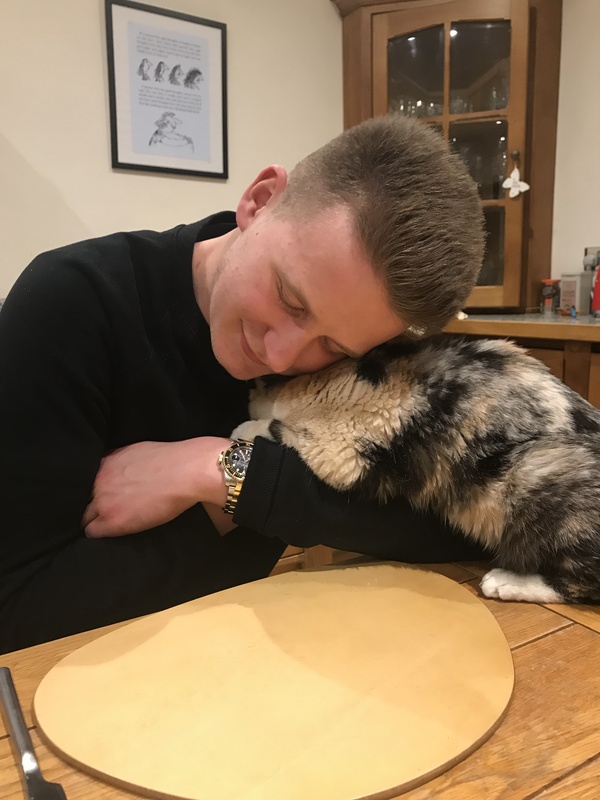 It’s so lovely to be around the cats and to get such love back from them all. We are busier than ever for next year, the diary has never been so full so early so if you do have a holiday planned please let us know as soon as possible. The donkeys are now in their full hairy winter coats and spend most of their time in the barn. They do not like the cold and wet so prefer to be waited on hand and foot in their dry quarters, we don’t mind they bring us such joy and are such good company. I have started taking Percy for walks around the lanes, it’s a slow process as everyone wants to stop and talk to him! He loves all the attention and it’s great for his education, although standing still isn’t as much fun as running at the moment! Talking of running my marathon training for London has started so Sunday mornings are spent doing my long run of the week. I’m up to twelve miles on my long run at the moment, goodness knows where I will find the energy to add another fourteen to that. It’s such a great opportunity though and if I can raise some money for charity then it will be worth it. Time to go back and entertain my lovely guests. Wishing you all a wonderful Christmas and a very Happy New Year for 2019 and thank you all for your loyalty to Hotel Cat. Sat here on what has been a wet and blustery October day watching the leaves falling off the trees, summer seems a distant memory already. This year has flown by and we are already planning Christmas, well wondering if we can get the donkeys to wear the elf hats that I have for them so that I can get a perfect Christmas card photo! Our house is almost finished and it looks lovely, the builders should have finished by the end of this week and it will seem odd to have nobody turning up during the day, odd but lovely – plus we won’t have to make copious amounts of tea and coffee! We have a new family member too. Someone sent me a link to a puppy that was in foster care through a charity called Pro Dogs Direct. They are a wonderful charity who find homes for unwanted puppies and ex breeding dogs. We fell in love with Sophie as soon as we saw her and applied straight away. She is a tiny Yorkshire Terrier who is blind in one eye and with a skin condition which makes her almost bald. She is a tiny missile who has us all eating out of her paws! She is always up to some form of trouble and we need eyes in the backs of our heads. It’s very cute when we walk around the farm in the evenings with the three big dogs, Nou the Ragdoll cat and this tiny pup in her little pink jumper! The Cat Hotel is very busy all the way through October and for a large amount of November too. We have had a gorgeous bunch of cats staying, mostly our lovely regular guests, but with one or two new faces who have been delightful and have all booked in for next year already. We are fully booked for quite a few dates next year and are at least half full for the popular months already. It’s a quiet Sunday afternoon and I’m off with my book to sit with my gorgeous guests, what a perfect day. We love May, it heralds the arrival of summer and everything looks wonderful here at the farm. We have baby birds galore and the bird feeders around the cattery are being filled at least twice a day to keep up with demand! The sheep have now had their thick winter coats removed and are much happier, they look very smart too. The donkeys are busy shedding their coats and we often see the jackdaws sitting on their backs picking at the loose hairs. Yesterday whilst sat outside I saw a red kite fly over, it’s only the second time we have seen them around here and I do hope they are here to stay. The cat hotel is really busy and filled with the most wonderful guests, I know I’m biased, but I do believe that we get the best cats staying with us. We have a pair of identical young ginger boys staying here at the moment. They are gangly with lean long bodies and must have purr switches everywhere as when you touch them they purr non stop! It’s lovely to see them so happy and I love watching their crazy antics – I find the outside rugs in all sorts of places where they practice their skidding moves! We also have our first Munchkin kitten, she too has settled straight in and is just gorgeous. We have made her steps so that she is able to climb up on the bed and cat trees. We have a busy summer ahead of us and can’t wait as it’s full of lots of our favourite guests.